A few years ago in the Argentinean desert, a shepherd was searching for one of his lost sheep when he spotted the tip of a gigantic fossil bone sticking out of a rock. When the news reached paleontologists at the MEF Museum in Trelew, Argentina, they set up camp at the discovery site to examine it and look for more bones. By the end of the dig, they had uncovered more than 200 other huge bones. As the program reveals, these fossils came from seven dinosaurs, all belonging to a new species of giant plant-eating titanosaur whose name will be announced soon. “When we learned that early signs at the dig site suggested this new species was the largest land animal ever known and experts were discovering such valuable information about the life of such giants millions of years ago, we were keenly interested,” says Fred Kaufman, executive producer of Nature. Sir David Attenborough, the film’s host and narrator, takes us through the twists and turns of the forensic investigation to find out more about this new animal. He talks to paleontologists studying the fossils, along with comparative anatomy experts, and with the help of 3D scanning, CGI visuals and animation, looks at what the bones reveal about the lives of these dinosaurs. He’s on location at the dig site and in the MEF Museum labs in Trelew, and present when a life-size skeleton of the dinosaur, built by a Canadian and Argentinean team of model makers, is completed. Raising the Dinosaur Giant airs Wednesday, February 17, 2016, at 8pm on WMHT. After the broadcast, the episode will be available for online streaming at pbs.org/nature. As Attenborough explains, dinosaurs roamed what is now the rocky desert of Patagonia during the Cretaceous Period, around 145 to 66 million years ago. The largest of these were plant-eaters known as titanosaurs. Among the fossils unearthed during the two-year excavation were bones from the giant’s front and back legs, which are vital in determining its body mass or weight, and those from its spine, which helped establish its identity. Dr. Diego Pol, chief paleontologist on the project, was pleased that the femur (or thigh bone), found by the shepherd, was well-preserved because it was of great value to the scientific study. At 2.6 yards in length, it also turned out to be the largest dinosaur bone ever discovered. To protect the fossils, weighing more than half a ton or so, on their journey to the museum lab, the team had to apply plaster casts on each limb. A road was even built to transport them. According to Attenborough, scientists dated these fossils to precisely 101.6 million years old by examining the ash deposits in the rock layers surrounding them. He shares the team’s discoveries gleaned from meticulous forensic work and makes comparisons to the biology of living creatures. Among some early findings are that the giants are thought to have eaten plants such as fern, cycads and conifers without chewing them; it’s estimated that its heart weighed just over 500 pounds to pump blood around its massive body and is thought to have had four chambers; and this largest titanosaur measured 121 feet from head to tail and weighed just over 77 tons. The film also follows Attenborough as he visits the largest known dinosaur nesting ground 500 miles north of the Patagonian dig site, where the remains of their eggshells can be seen scattered for miles. He discloses that hundreds of buried titanosaur eggs, originally laid on an old river plain, have also been found intact. The unhatched ones were preserved in mud when the river flooded, providing clues to what a baby titanosaur may have looked like. 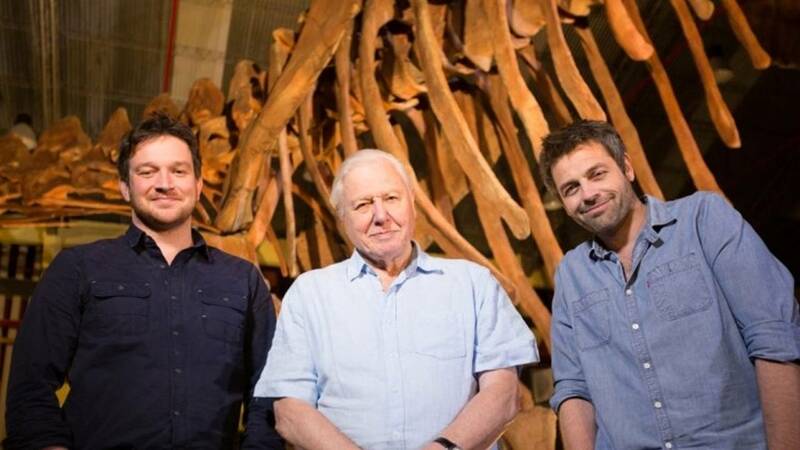 “Like so many people, young and old, I am fascinated by dinosaurs,” says Attenborough. The subsequent confirmation from Dr. Pol that they believe they had discovered the largest dinosaur ever known was like icing on the cake. But the research continues as the fossils contain many secrets yet to be revealed. Nature is a production of THIRTEEN Productions LLC for WNET. For Nature, Fred Kaufman is executive producer. Raising the Dinosaur Giant is a BBC Earth with PBS and THIRTEEN Productions LLC. The Executive Producers for the BBC are Mike Gunton and Miles Barton, and the Producer/Director is Charlotte Scott, from the BBC’s Natural History Unit. Nature has won more than 700 honors from the television industry, the international wildlife film communities and environmental organizations, including 16 Emmys and three Peabodys. The series received two of wildlife film industry’s highest honors: the Christopher Parsons Outstanding Achievement Award given by the Wildscreen Festival and the Grand Teton Award given by the Jackson Hole Wildlife Film Festival. The International Wildlife Film Festival honored Nature executive producer Fred Kaufman with its Lifetime Achievement Award for Media. Support for this Nature program was made possible in part by the Arnhold Family in memory of Clarisse Arnhold, Sue and Edgar Wachenheim III, the Kate W. Cassidy Foundation, the Lillian Goldman Charitable Trust, the Filomen M. D’Agostino Foundation, The Arlene and Milton D. Berkman Philanthropic Fund, Sandra Atlas Bass, Rosalind P. Walter, the Corporation for Public Broadcasting and public television viewers.